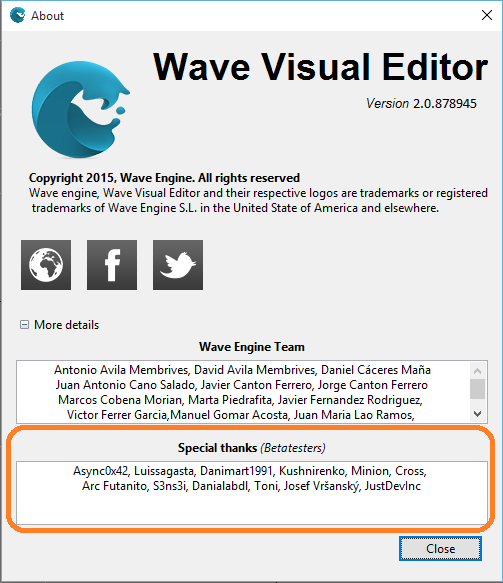 Today the Wave Engine 2.0 private beta program was closed. During the development of the new version it has been very important to have support and feedback from the developer community. So, on January 30 2015 we opened a private beta program. Such allowed any game developer to subscribe for testing previous (alpha and beta) versions. The welcome was amazing and in few days we had a long developer list prepared to send feedback and help us in reach our goal of creating a new great Engine version, useful to game developers community. The steps were subscribers received a mail with access to download new Wave Engine versions and access to a private forum where they could write opinions, bugs and improvement about alphas and betas. At first the access to private beta program was very restrictive. We spent most of the time developing basic features, so we were in a very early stage and we were unable to process large amount of feedback. So, until June 2015, the sum total of subscribers with access to program were of 70 developers. After starting the last stage, where we had most features implemented, we gave access private beta program to all subscribers with the collaboration of around 1000 developers from around the world. There have been many months working in which we have come to publish up to 12 different versions of Wave Engine. From 1.9.1 to 1.9.12, the last one. And we would like to thank all game developers who participated in the private beta program. For us it has been very useful to know different opinions and improvement proposals that we have used to make Wave Engine 2.0 better and better. Now, we start a new stage in which we will work in all the details for the upcoming release of the new Wave Engine version. For this stage, we are going to publish a new web, a new documentation, video tutorials and articles about everything Wave Engine Team has been working for the last year. Everything will be published on next September 15. We are very excited about this new Wave Engine version, we think have taken a giant stride forward and we hope that Wave Engine community members will help us to make known it to game developers around the world. Thank you from the whole Wave Engine Team.